Joseph is becoming such a big boy! He just turned 18 months old. I can't believe the time has gone so fast! Everyday he learns more and more. He is not talking much yet, but can say a couple of words and is able to express himself. When he is mad he bangs his head on the ground, when he is hungry he pounds at the refrigerator. When he is tired he becomes more snuggly with me and will wrap himself in a blanket. Lately we've gotten into a routine in the morning where we get up and I make him breakfast. He sits down in his Elmo chair and I flip on Mickey Mouse Clubhouse for him and give him his breakfast bowl which consist of a banana and some sort of cereal or toast and a sippy cup. Meanwhile I make my coffee and check my email. The cutest thing Joseph does though is that when he is done with breakfast he brings me over the bowl and cup and proceeds back into his play area. Its so adorable that he picks up after himself! I've come to look forward to his gentle act of kindness and cuteness! 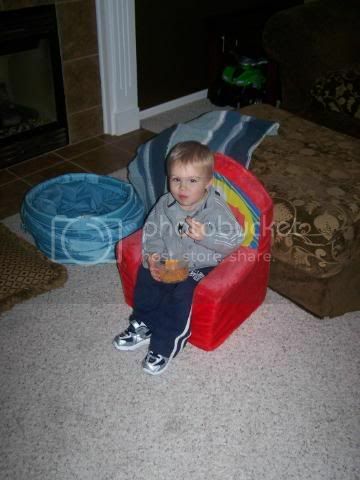 Here he is eating a snack in his Elmo chair. 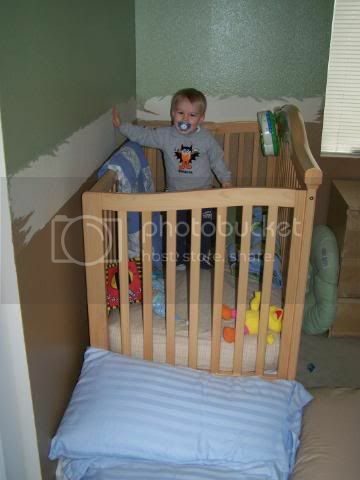 Last week Joseph figured out how to get out of his crib. My brother and sister were over and I had put Joseph down for his bedtime. 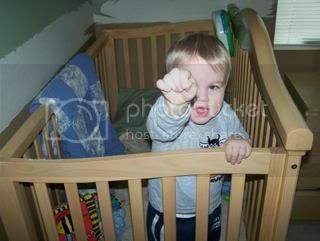 Normally he plays in his crib for awhile and was fussing a little but no big deal. I can hear him on the monitor downstairs, so I know he is ok. Well all of a sudden we hear this huge thud come from upstairs. My sister and I dash upstairs and open his door only to find him trying to open it on the other side. Needless to say it scared the crap out of me. 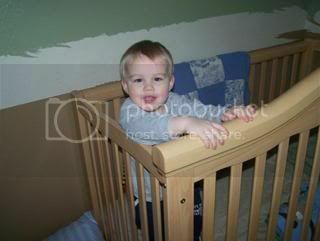 After some deliberation and thought of trying to find a way to keep him in his crib we figured that flipping his crib so that the lowest rail side was against the wall was the best plan of action. I should also add that Joseph is notorious for pulling his wall paper off the wall when the crib is against it, so for a the past couple of months we have moved his crib away from the wall, but since I wanted him to stay in his crib we had to put it against the wall. Unfortunately that meant me ripping part of the wall paper off b/c lets be honest he would have done it himself and probably would have eaten it too. Along with rearranging his crib I put some pillows down on the floor that could also double as a bed or reading time for me and him. 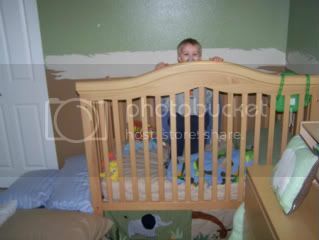 He hasn't tried to get out of the crib since, but I will be keeping it this way until he transfers to a toddler bed! Here are some pictures of his new arrangement! I am so sad that I had to rip the wall paper down! It looks so bad right now and very messy looking, but I guess you gotta do what you gotta do! I can't wait to put the wall paper back up when the time comes! 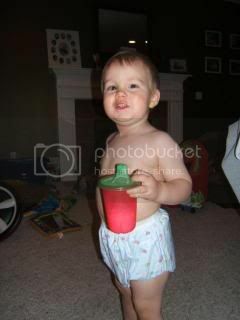 We've started the intial steps for potty training, but haven't gotten far b/c Joseph refuses to sit on the potty seat. I am not going to push it b/c he is obviously not ready yet. He does occasionally wear training pants, and doesn't seem to mind them, but the potty seat is the first big step he will take and when he is ready, I am ready! Next week Joseph, me, my mom, and my brother are headed to San Jose, California for a long weekend. My cousin is having an engagement party and I will be able to introduce Joseph to my extended family. 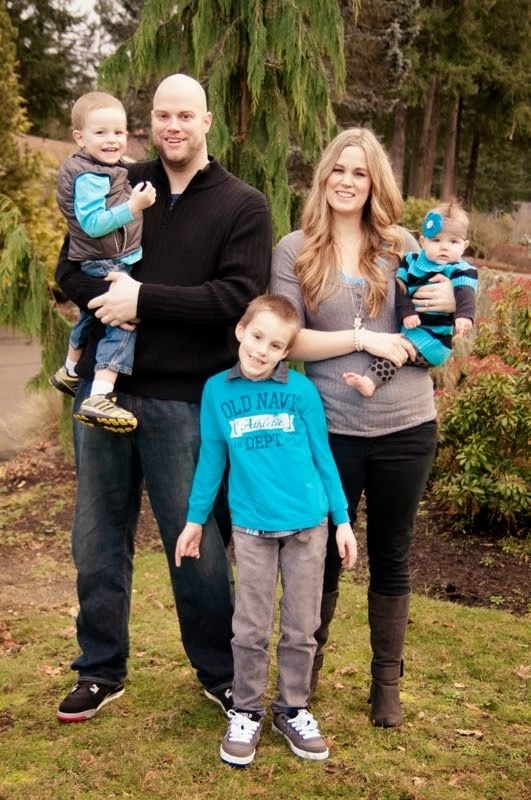 My other cousin, Diana, just had a baby boy, Matthew, so I can't wait to meet him as well. This will be a nice mini vacation and I am really looking forward to it! Joey looks a bit constipated...and WOW, look at those UGLY undies! I can't believe you put him in those! haha. Auntie Kara will have to get him so normal undies so he doesn't look like such a grandpa!